Our Company Branded Spoon Mugs are the new stylish personalised mug that certainly stand out from other promotional mugs! Great for personalising your corporate branding and logo on it's surface, your new batch of Company Branded Spoon Mugs are the suitable advertising method that act as your little silent salesmen - gaining business opportunities and reciprocation from such a generous company freebie! Nothing like a feature with our Company Branded Spoon Mugs as the spoon slot within the handle - just makes you want to prepare a drink of hot chocolate with a layer of whipped cream topped with marsh mellows..
Hand out a much appreciated business gift such as the Company Branded Spoon Mugs,to rewarding customers and clients, and raise your profit margins too! 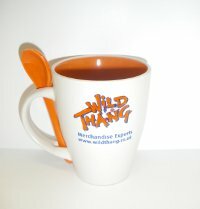 For a FREE QUOTE, please fill in the form regarding our Company Branded Spoon Mugs and we'll be able to help you.